This has been a violent weekend in China with a bombing at a government building in Tianjin, and riots in Xintang near Guangzhou and Lichuan in Hubei (see New York Times report). Both riots were caused by anger with local governments. The riot in Xintang apparently started after a dispute between migrant street vendors and local security guards, who like chengguan, are often just hired thugs who do the bidding of local governments and real estate developers or businessmen. 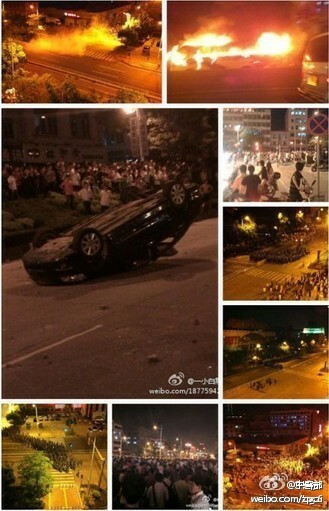 Chinese Internet users on Weibo have been sharing photos of the riots in Xintang an Lichuan, often without text annotation to make it more difficult for the web censors to find and delete the offending materials. But the Chinese news media has been almost completely silent about both riots. The Xintang affair: Some people have asked why don’t they let the media investigate openly, and find out the truth so as to appease public indignation. But behind a security guard (hired thug) is a policeman or a village official. Behind the policeman or village official is their superior, who also has a superior — a chain of interest groups that makes it really difficult to touch any one of them. The case of Yang Jia was a notable example: The only way to have any effect on that chain of interest groups is with a huge sacrifice.